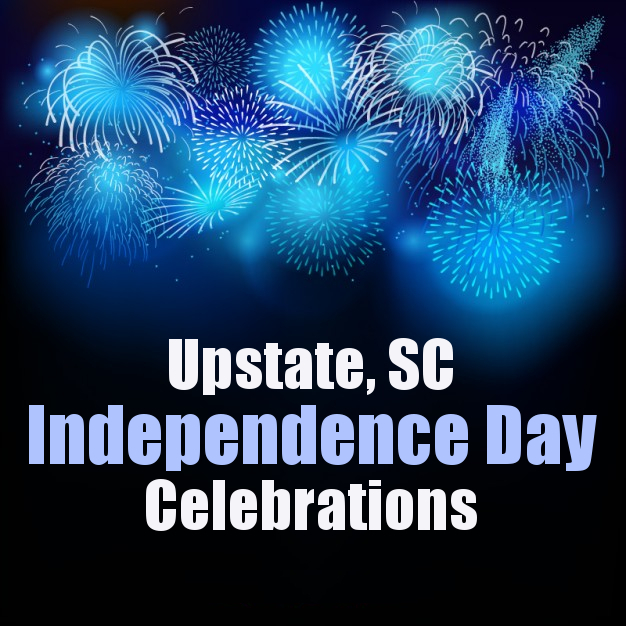 Lots of Independence Day festivities light up the Upstate,SC this year. There is always a variety of festivities that celebrate our nation’s independence: patriotic performances, music events, contests, fireworks. We have several of the best 4th of July events happening in the Upstate. Mark your calendars for 2016 Independence Day celebrations near you. One of Greer’s largest festivals, Freedom Blast, takes place June 25th. This family friendly event pays tribute to America’s independence. There will be live music, food, inflatables, and activities and crafts for kids. Spectating the event will also enjoy watching one of the largest fireworks displays in South Carolina and displays by the S.C. Army National Guard, Disabled American Veterans, and many other organizations. This family friendly event hosted by the Whitefield Baptist Church will be held at the church’s front lawn. There will be food for sale and treats at the venue plus games for kids, car and motorcycle show, music by Jason Crabb, fellowship, and a huge firework display. Simpsonville celebrates the Independence Day at Charter Amphitheatre at Heritage Park with family fun-filled activities. Greenville Symphony Orchestra will provide the music entertainment and there’s a spectacular firework display to watch out. This is a FREE event for all. One of the anticipated Independence Day celebrations in the Upstate, Greenville’s Wells Fargo Red, White & Blue Festival will light up the night sky with incredible firework display at 9:45 pm. Apart from the main event, spectators will also enjoy live music on two stages, fun-filled activities in the Zaxby’s Kidz Zone and a variety of popular food and beverage vendors. The event takes place in downtown Greenville from Court to Camperdown streets and will encompass Broad Street, from Laurens to Falls Streets, and Falls Park. Spartanburg will celebrate the 4th of July with a bang! Expect great food including BBQ, funnel cakes, burgers, hotdogs, philly cheese steaks, ice cream, and more! There will be live music as well presented by the Spartanburg Community Band and Adam Craig. Plus a spectacular Firework display presented by Zambelli Fireworks. Kick off your evening with an Independence Eve performance by the Jake Bartley Band, performing at 7 p.m.! Take the family to enjoy food, music, rides, and more. Ride wristband for all day pass is available for $10. Join the Holly Springs Fire and Rescue District and celebrate the 4th of July with a fun-filled activities for all including “Cuties for a Cause” pageant, Inflatables for Kids, Classic Car Cruz-In, World’s Best Firehouse BBQ, Live Music, Great Food Vendor and Concessions, a spectacular fireworks show! Easley plans a two day “Celebrate America” event this year. There will be food, vendors, and carnival rides at the event. Fireworks display begins at 9:45 pm on July 4th. Fun continues the following day with music performances. Bring the entire family, it’s a free event!